I decided to use the new Birthday Delivery stamp set along with the Birthday Memories DSP. 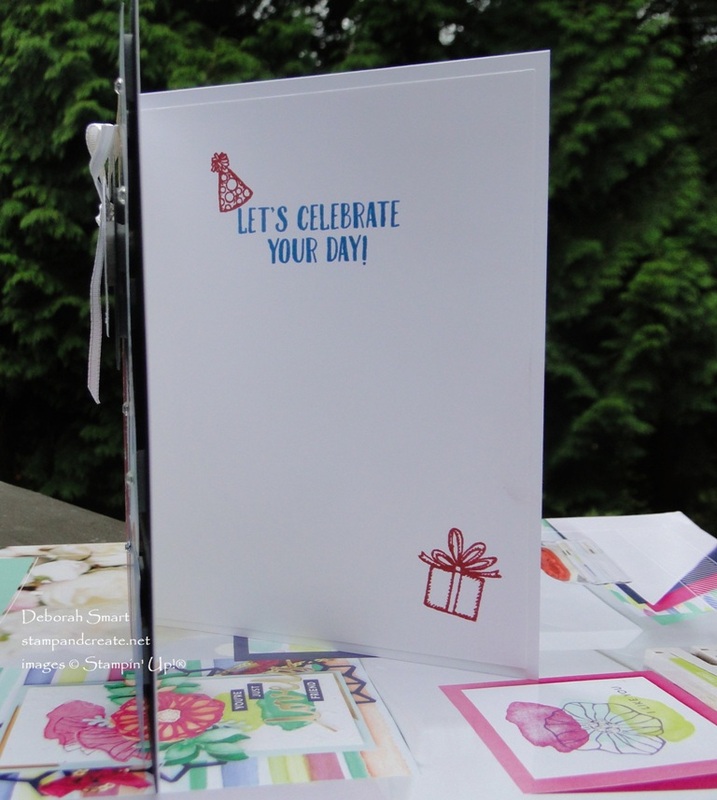 The Birthday Memories Designer Series Paper is perfect for this type of layout! It shows off the great colours and patterns in the paper. I could have created my own backgrounds using the stamp set – but hey; why reinvent the wheel?! The great thing about the Craft Project Central Challenge is that the designer of the challenge provides a tutorial on how she created her card, including all the dimensions! So I didn’t have to spend time fiddling around, figuring out which sizes would fit best. Thanks so much for that, Regina! 🙂 So make sure you check out the challenge – and join in, yourself! After cutting my DSP to the appropriate sizes, I layered them onto a 5 1/4″ x 4″ piece of Basic Black cardstock. I used Stampin’ Dimensionals because I like that look the best. The sentiment is stamped onto Whisper White cardstock in Pacific Point ink. I used my Big Shot and the Stitched Shapes Thinlits to die cut the White and Black cardstock, then again used Dimensionals. The bow is the 1/8″ Sheer Ribbon in Whisper White, attached with a Glue Dot. Finally, I added some Rhinestone Basic Jewels scattered across the card front. The whole panel was the added to the Whisper White cardstock base. Of course, you have to add something cute to the inside, when the outside looks so good! The sentiment is topped off with the cute little party hat image, and a little gift box added in the bottom corner. Both of these are from the Birthday Delivery stamp set. I hope you’ve enjoyed seeing my card! We’re having such beautiful weather here, that I just had to take my card photos outside! Previous Previous post: Bonus Days Have Started! I love your take on this sketch challenge. It is such a fun card! 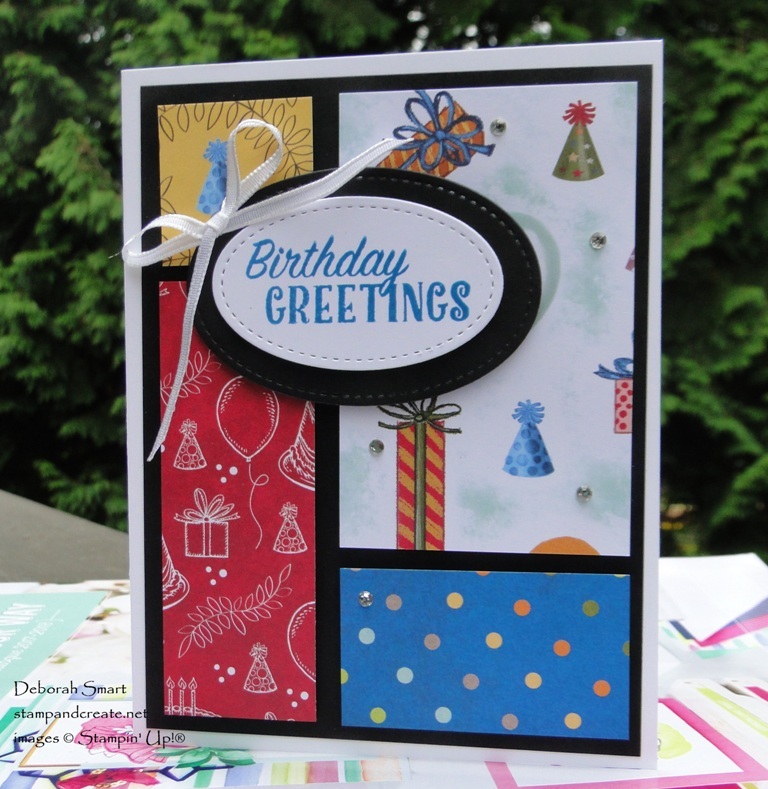 What a fun card, Deborah – and a great take on the challenge. Thanks, Buffy 🙂 So glad you like my card. It’s a great layout, and I’m glad I saw your DT card. It’s what prompted me to join the challenge! This is a party in/of a card!!! The papers that you chose are bursting with color and celebration–I love it!!!! Thank you so much for participating in Craft Project Central’s sketch challenge #73!! Thanks for such a nice comment, Regina! I just loved your sketch layout; it’s brilliant. I really like your card, the layout is perfect for that paper!